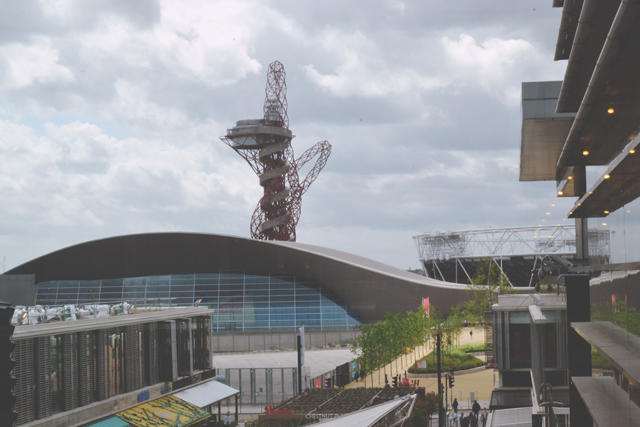 Way back in 2012, during the height of the Paralympics, Rich and I visited Westfield Stratford City. We had such a great time, so I was ecstatic to be invited back to encounter the full Westfield Stratford City experience. I was very kindly provided with a gift card and, on picking it up at the concierge desk, was served by a lovely and super helpful girl called Joanna. She saw I was a bit confused and quickly approached me to help before activating the gift card. I was even given an array of card designs to choose from and, of course, I went for the pink floral one! The gift card is such an easy way to shop. It's accepted by all shops, restaurants and leisure facilities that accept Maestro cards so you can pretty much use it everywhere. It was so easy to use- You just swipe it in the card machine and sign the receipt so the cashier can authorise payment. The best thing for me was the QR code on the back. 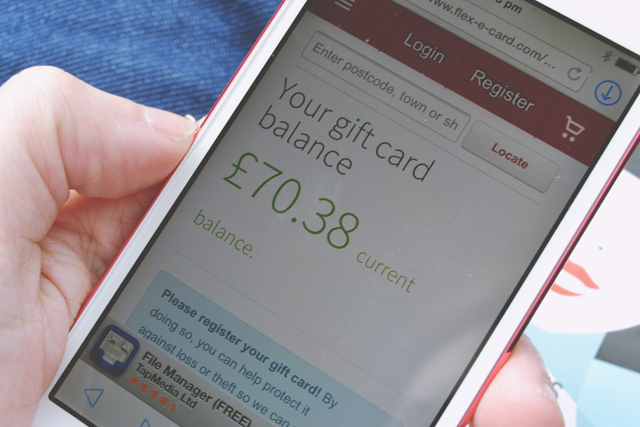 Using a QR reader on your phone (you can install one using Westfield Stratford City's free wifi if you don't already have one), you can easily see your balance as well as a statement detailing what you have spent so far. If you're stuck for a present ideas, this is so much better than standard vouchers! 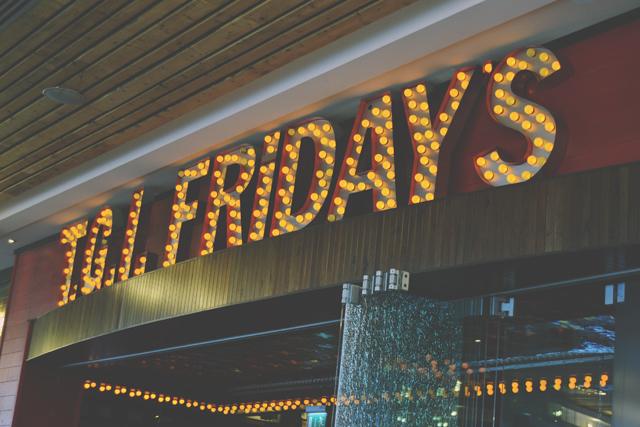 Arriving at lunch time, I was a bit peckish so my first stop was TGI Friday's for lunch. I was drawn in by the sounds of Guns n Roses blaring out from the restaurant door. Once seated in a comfy, circular booth, the great tunes kept on coming: Nirvana, Alice Cooper and even a bit of Backstreet's Back. The best thing about my booth was that the circular shape gave a little privacy, so I could boogie away without any weird looks from other diners! I chose the cheesy garlic bread (best garlic bread I've ever had!) 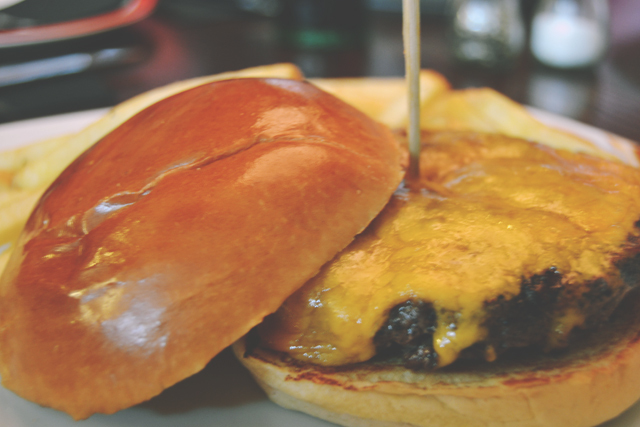 and the cheeseburger deluxe. Unfortunately, although I asked for no mayo, it arrived smothered in barbeque sauce instead, and I was charged for extra mayo when I was given the bill. The bubblegum daiquiri, on the other hand, was absolutely amazing. I don't tend to drink alcohol, but this cocktail is so lovely that I can't resist! It really tastes like bubblegum (the rum is barely detectable), it's dipped in popping candy and, of course, it's a lovely pink colour! After all that burger and sweet cocktails, I decided to take part in a little light sporting. 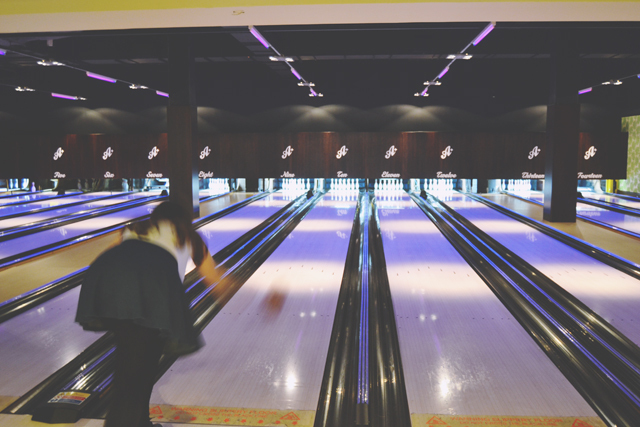 A bowling alley in a shopping centre? Yes! 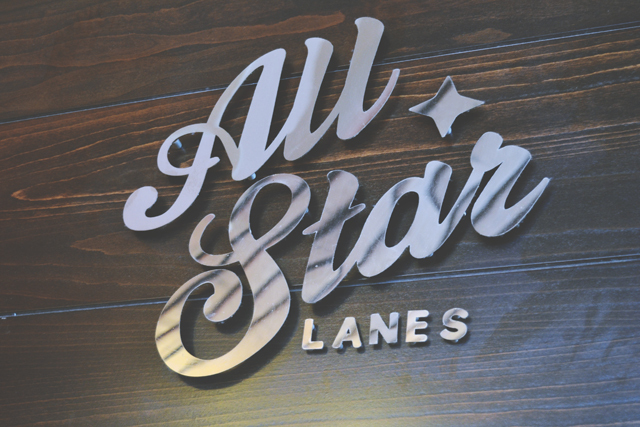 All Star Lanes is a really fun, Americana themed bowling alley and restaurant/cocktail bar combo. Because I'm a weakling with the world's smallest hands, I have to use the smallest ball in the venue. It took me ages to find a 6lb ball but eventually I located one and, as you can see, I was pretty pleased about it! I only felt slightly inferior with the 7 year old in the lane next to mine bowling with an 8lb ball! 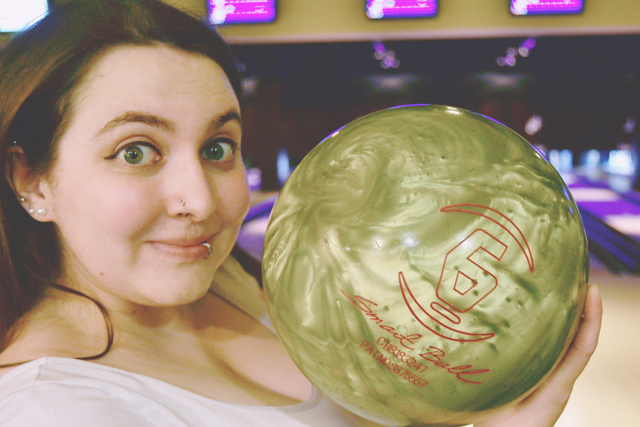 I always thought I was pretty average at bowling but, as it turns out, I'm awful! 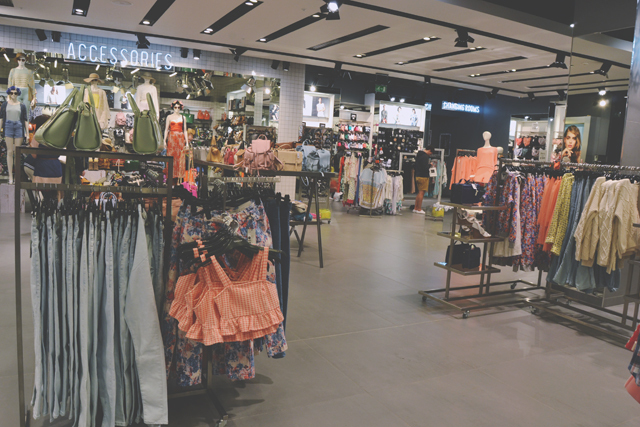 Nevertheless, it was a lot of fun and provides a great little break when you're shopping. I didn't sample the food or cocktails, but I'll definitely try them next time I'm there! You can even order food and drinks to be delivered to your lane so you don't need to pause the game. 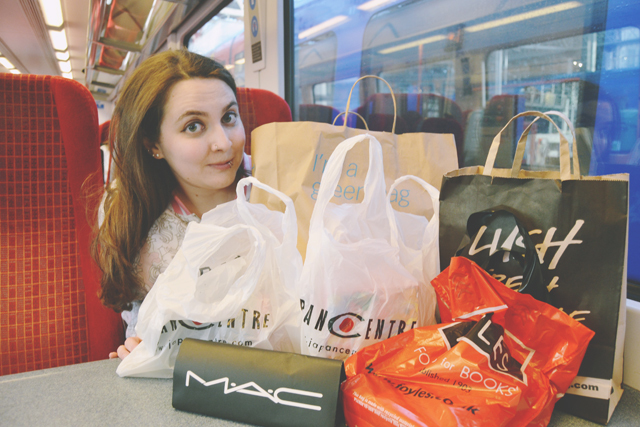 After a quick stop off to admire the view of the Queen Elizabeth OIympic Park, it was time for my favourite thing: Shopping! I was really impressed with the whole crowd situation. I was anticipating crazy shoppers squished in like sardines but, in reality, it was no busier than any other shopping centre on a Saturday. 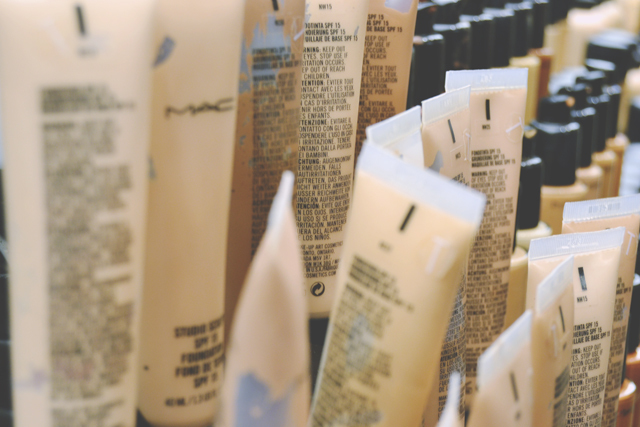 Perfectly manageable and none of the shopper-induced rage that I am sometimes prone to! 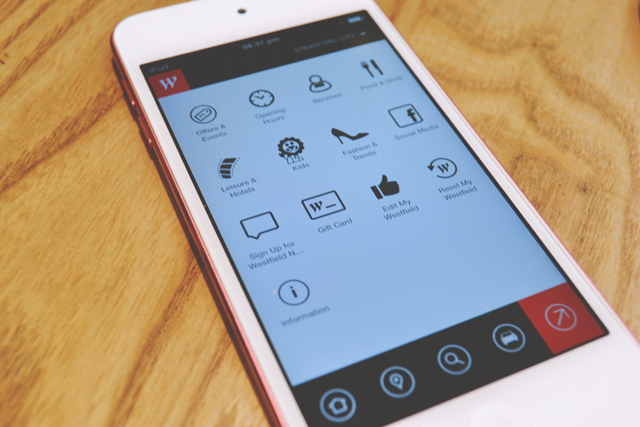 I'd downloaded the Westfield app (another time that the free wifi came in handy! ), and it was a lifeline. The shopping centre is massive. I mean really, really, really huge! The largest urban shopping area in the EU, no less! There are 300 shops and services, so I made full use of the interactive map on the app. 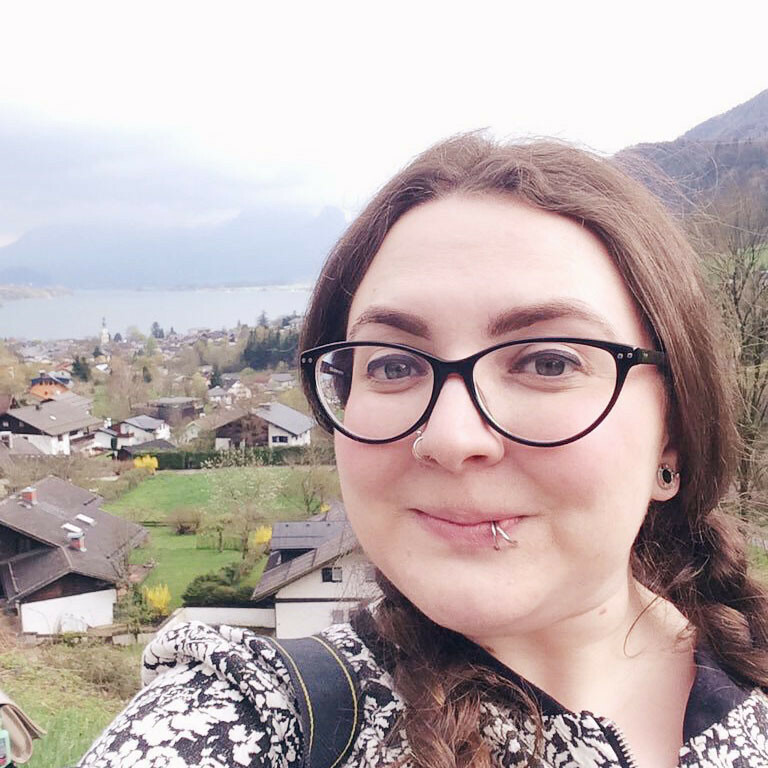 I was determined to walk around the entire centre, but there were some shops that I particularly wanted to visit, which is where the app came in handy. First we visited Urban Outfitters, where I found this very rude necklace! Next stop: MAC! 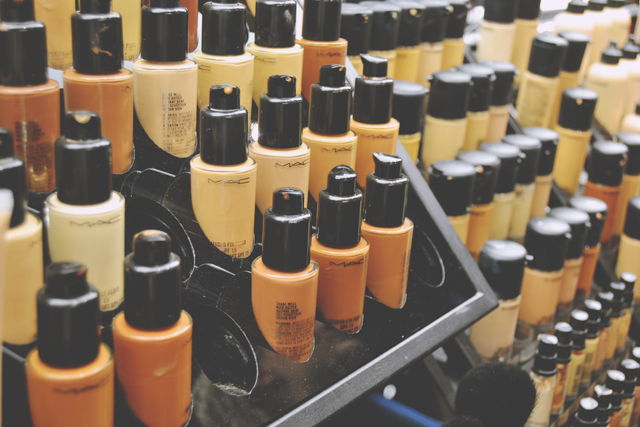 The shop was insanely busy and the line stretched halfway down the shop, but at least it gave me the perfect opportunity to take lovely photos of all the make up! Look how pretty the Alluring Aquatic packaging is! I love the water drop effect. 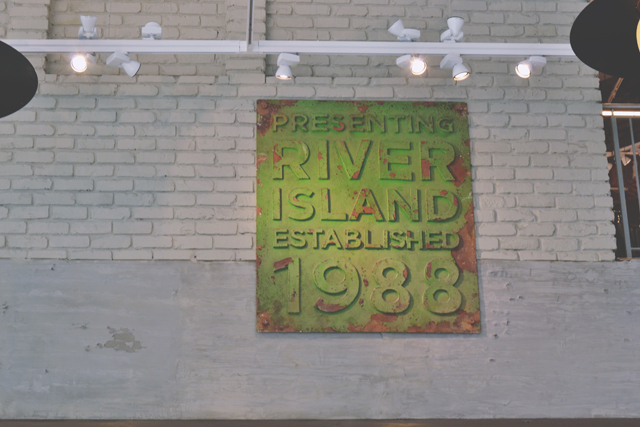 The interior design of River Island is fantastic. And, look, it's the same age as me! 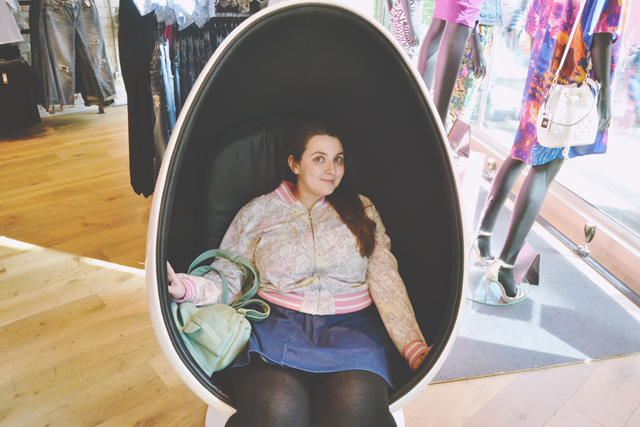 The best thing about Westfield Stratford City's branch of River Island is the egg chair next to the doors. I spent far too long spinning around in it. I can't even express how comfortable it was- I must get one for my own home! Next up was the mothership! 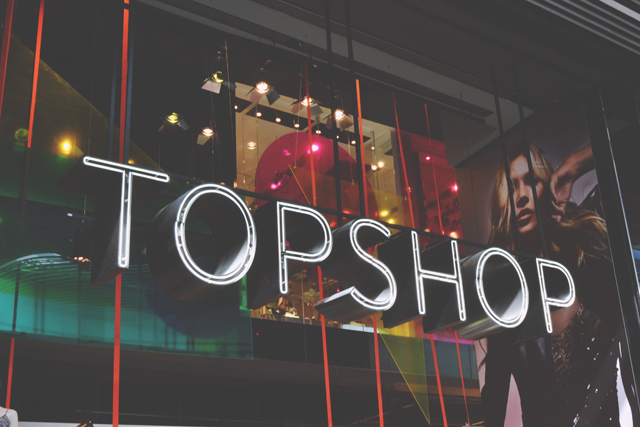 Let me tell you, this is my favourite branch of Topshop ever. Look how lovely and spacious it is! Not at all hot or crowded, and with loads of space to move between the rails. Perfection. 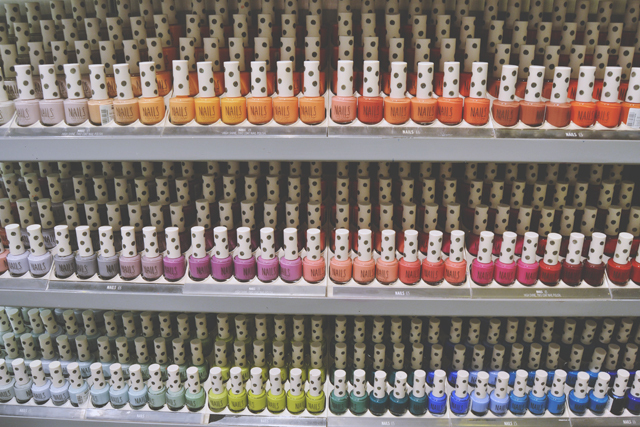 Oh, and it has a nail varnish or two! 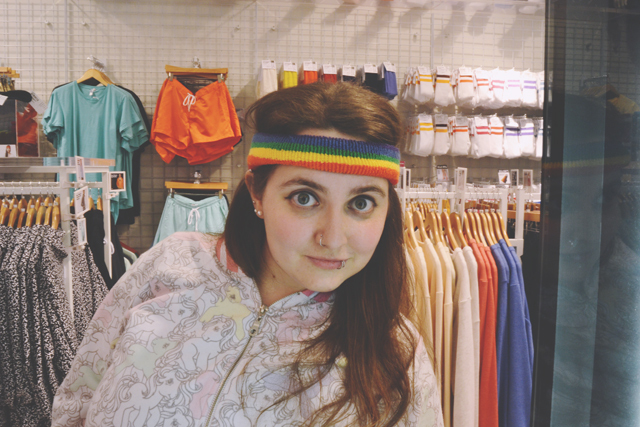 A quick pop into American Apparel and then nipping out to explore the shops outside. 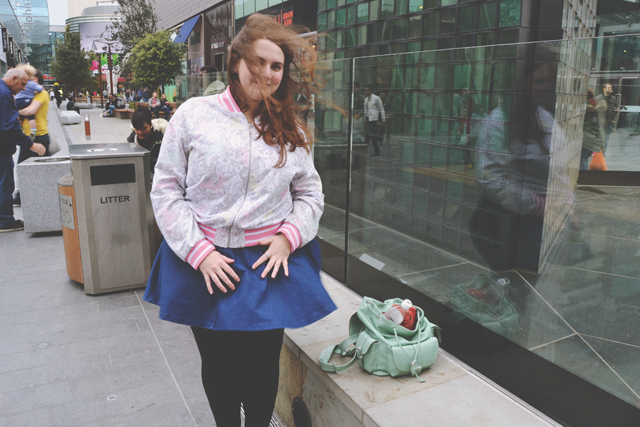 It was a very, very windy day! 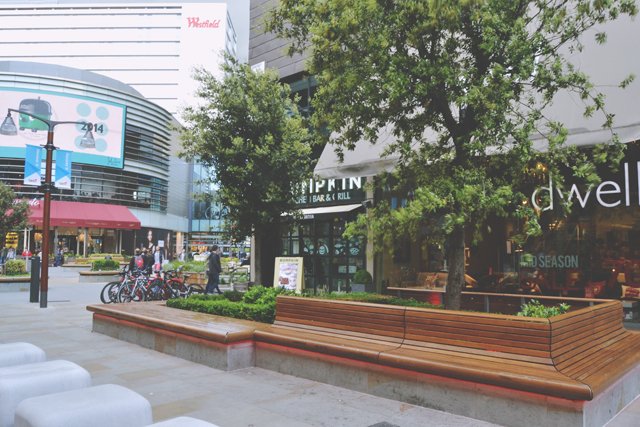 Outside, there are loads of lovely places to sit with trees and shrubs all around. The trees are dotted with fairy lights which adds a pretty, magical effect to the area. 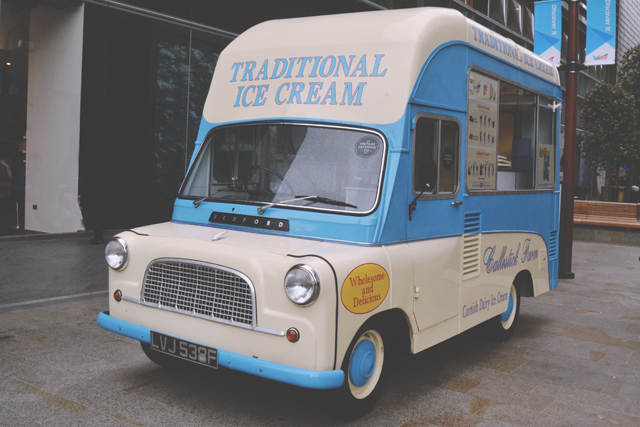 Plus, there was this adorable vintage Bedford ice cream van. I had my first experience of Zara Home and I loved it! 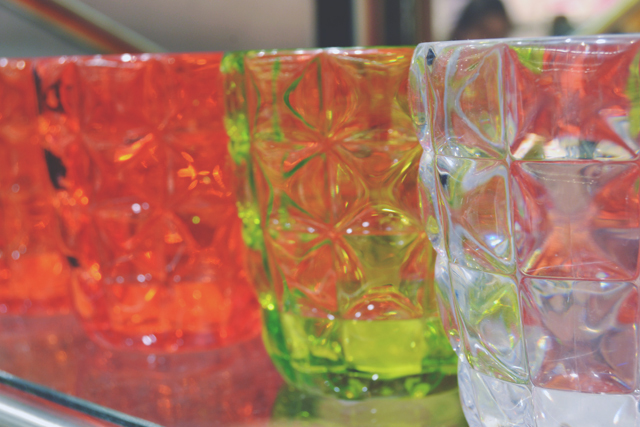 These colourful glasses were my favourite. On re-entry to the building, I headed straight to Lush to pick up some more bath products. It was a lovely store, with a bench next to the door- Perfect for long suffering boyfriends and husbands! 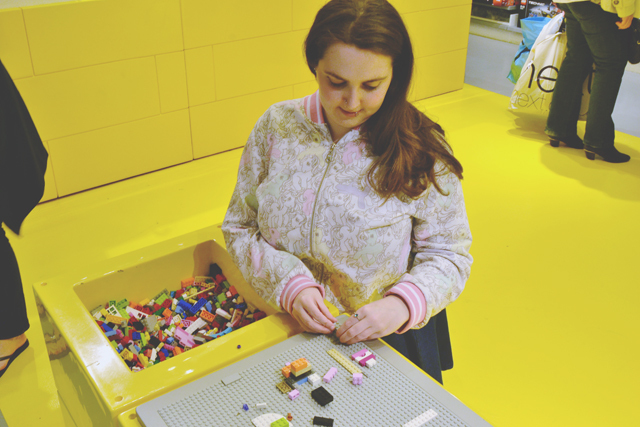 After a donut break at Krispy Kreme, I made a beeline for the Lego Store. 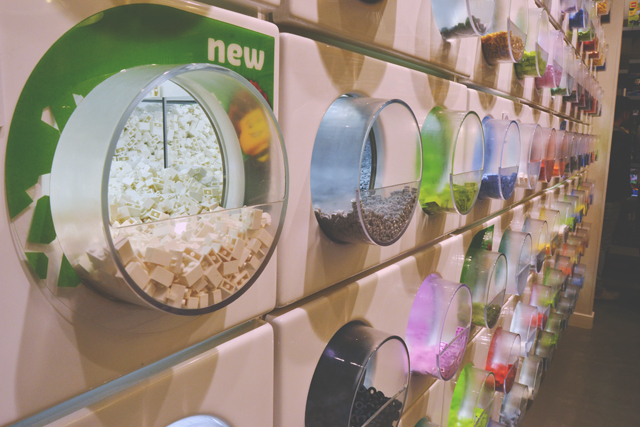 How cool are these Lego brick dispensers?! I was hoping to find a Lego Snape but, unfortunately, the (very nice) sales assistant told me that Harry Potter Lego hasn't been produced for a couple of years now. Boo! My penultimate store was Umai, which is a grocery store owned by Japan Centre. 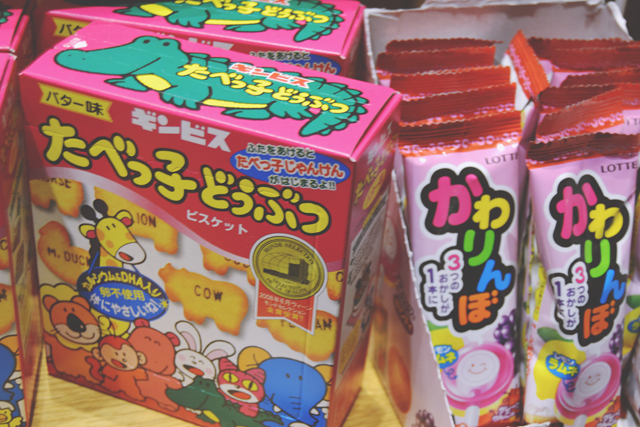 There were so many Japanese goodies for sale, from cute pop-culture sweets, to 5kg bags of rice. 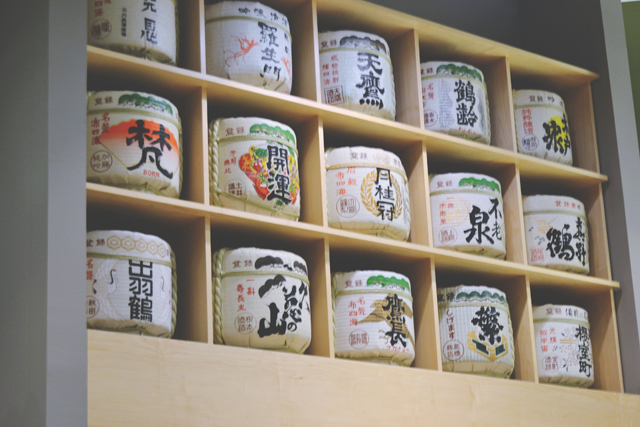 There was even fresh sushi made instore and a little table of Japanese gifts. Finally, I ended my day with a trip to Primark, strategically timed so that I wouldn't spend everything I own in one shop! 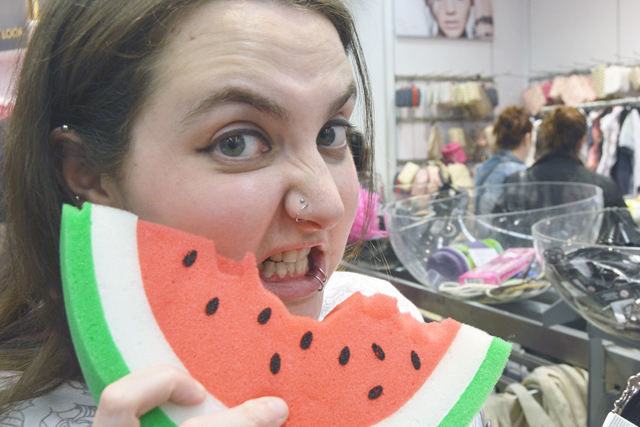 Although I didn't buy this awesome watermelon sponge, I did pick up some gorgeous pieces for summer. After a whopping 6 and a half hours in Westfield Stratford City, during which time I managed to visit every corner of the centre, it was time to head home. I was absolutely exhausted but I'd had such a fun time! From Umai: Animal biscuits, chocolate-filled koala biscuits and a cuddly ram. 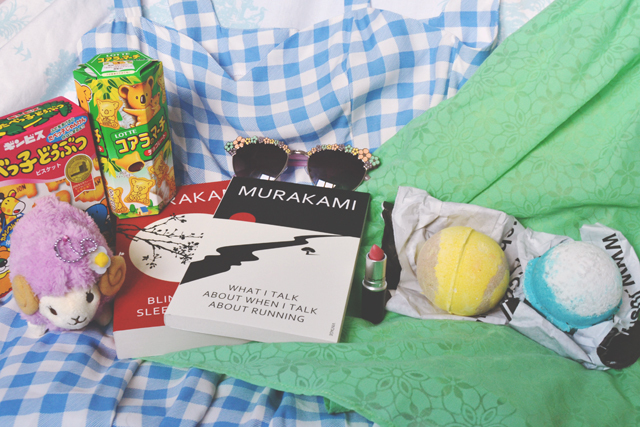 From Foyles: Two new Murakami books. (I know, you're surprised). 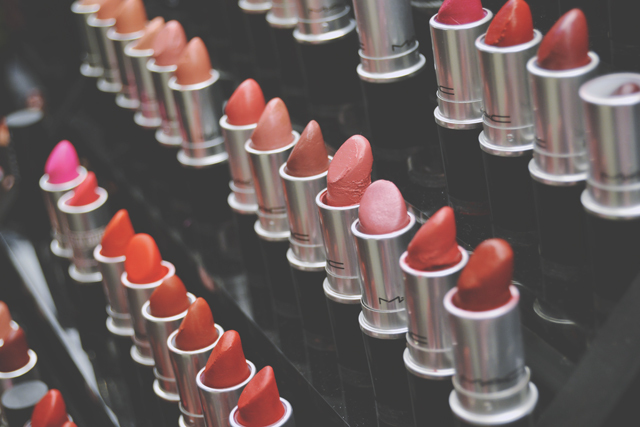 From MAC: Please Me lipstick. 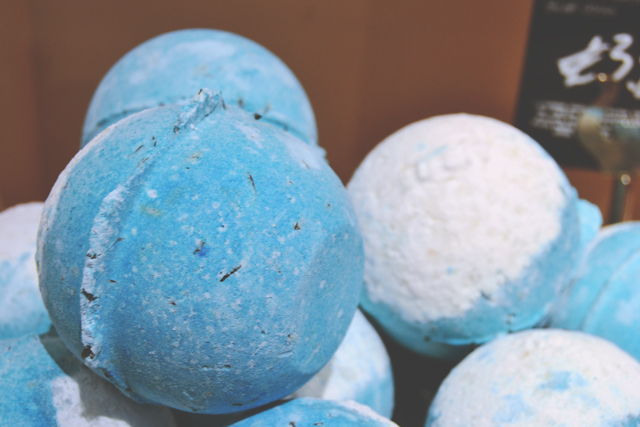 From Lush: Honey Bee and Big Blue bath ballistics. From Primark: Gingham dress, floral skirt and floral sunglasses. A huge thank you goes out to Westfield Stratford City for having me, and to all the wonderful staff who were so helpful and accommodating! I had such a great time and I can't wait to return. I know! I wish I'd got it now! 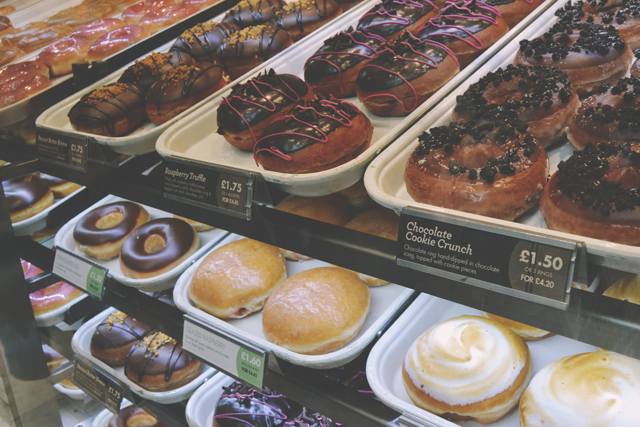 Oohh, I can do with a krispy kreme doughnut right about now! 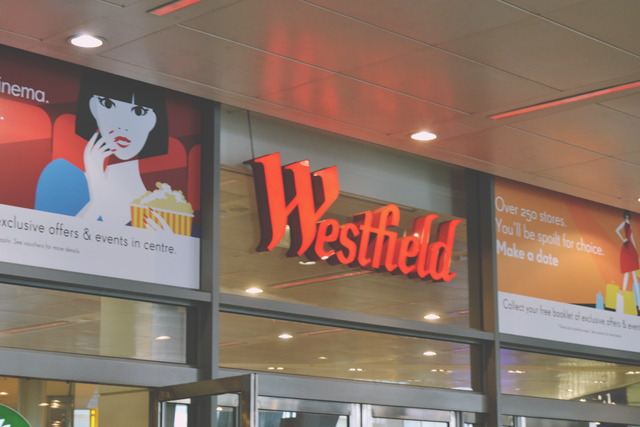 Westfield looks like a good place to shop, I need to go there soon! Ooo, I love Westfield so much! One day simply isn't enough to take it all in!! There's SO much! It's amazing! I was really lucky that it wasn't bad at all when I went. I was expecting it to be heaving so it was a pleasant surprise! Haha that's always the danger! That was my favourite photo of the day! It's so yummy! Sorry for being an enabler haha! Oh wow what an awesome trip. 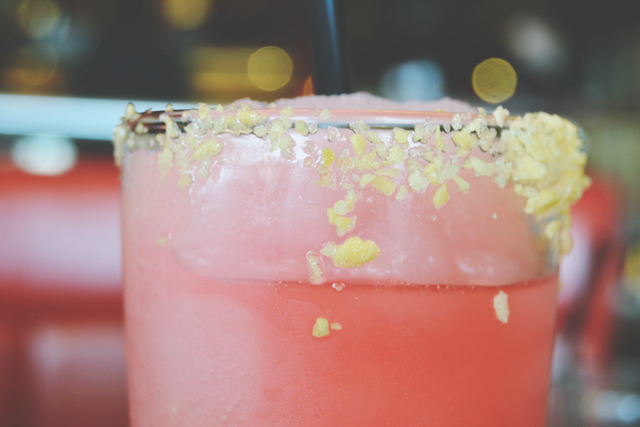 I had a popping candy margarita at TGI's and it was so nice! I didn't know they did it as a margarita too. I love the popping candy- I was licking it off the glass haha! It was a great time. I love it too! 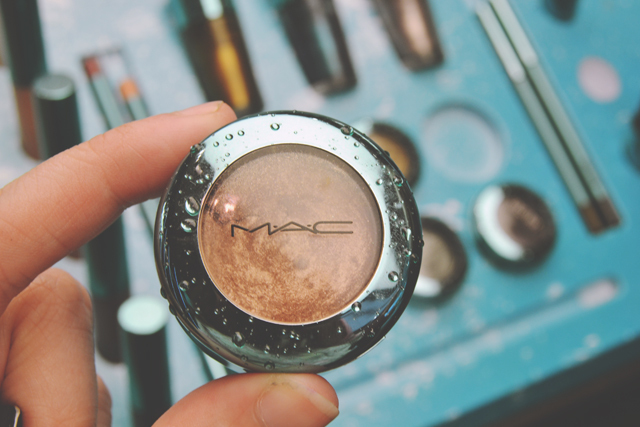 I just love your blog - not only are your photos beautiful, but you have an amazing writing style as well! 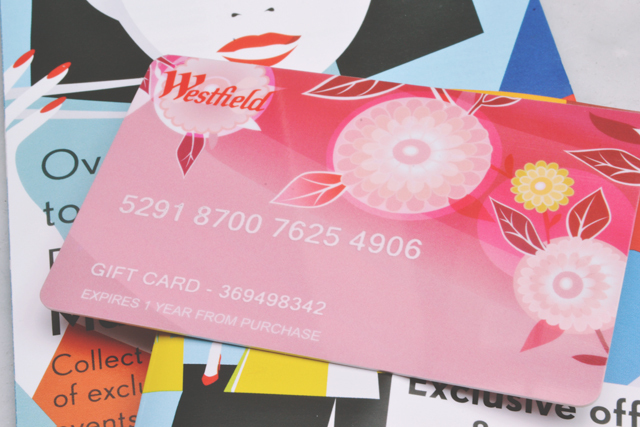 I got a Westfield gift card for Christmas last year. I would be happy to receive this is a present for EVERY Christmas. Not even Christmas. Every day. EVERY DAY. Love them, they're so handy! Haha I could go for one every day too!! Yeah, they're too big for me. Seriously. Oh no., that is dangerous haha!